President and CEO Alan Mulally joined Ford Motor Company in September, 2006 where he also serves on the company’s Board of Directors. Prior to joining Ford he served as Executive Vice President of The Boeing Company and CEO of Boeing Commercial Airplanes where he was named President in 1998. 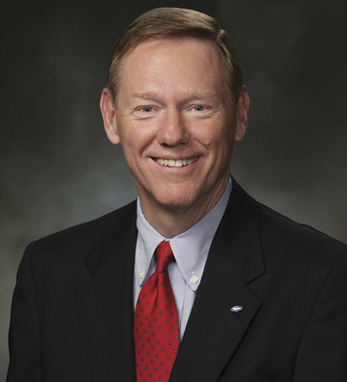 Recognized throughout his career for his industry leadership, Mulally was named “Person of the Year” in 2006 by Aviation Week magazine and one of the “Best Leaders of 2005” by Business Week. Mulally holds both a B.A. and an M.S. in aeronautical and astronautical engineering from the University of Kansas. He has also earned a master’s in management from the Massachusetts Institute of Technology and was a 1982 Alfred P. Sloan fellow. He has sat on the advisory boards of NASA, the University of Washington, the University of Kansas, Massachusetts Institute of Technology and the U.S. Air Force Scientific Advisory Board. With a surname derived from the native Gaelic O’Maolalaidh, Mulally’s Irish roots can be traced to the western counties, Galway in particular.